Scientists Say They've Found Hidden Space In Great Pyramid Of Giza : The Two-Way Researchers used equipment that detects muons. Measuring the density of the tiny particles yielded an image of what's behind the pyramid walls with no damage to the ancient structure. This illustration shows the known rooms of the Great Pyramid, including the Queen's Chamber, the King's Chamber and the long Grand Gallery, along with the newly discovered void, which is depicted as a fuzzy oblong shape. The Great Pyramid of Giza has been probed with the tools of modern particle physics by scientists who say they have discovered a huge, secret space hidden within its ancient walls. It is located above a tall, cathedral-like room known as the Grand Gallery, and this newly found space is comparable in size — about 100 feet long, according to a report in the journal Nature. That makes it a major structure within this royal tomb, which was built around 2500 B.C. and is considered to be one of the Seven Wonders of the Ancient World. Yet until now, despite centuries of study, no one knew this space was there. 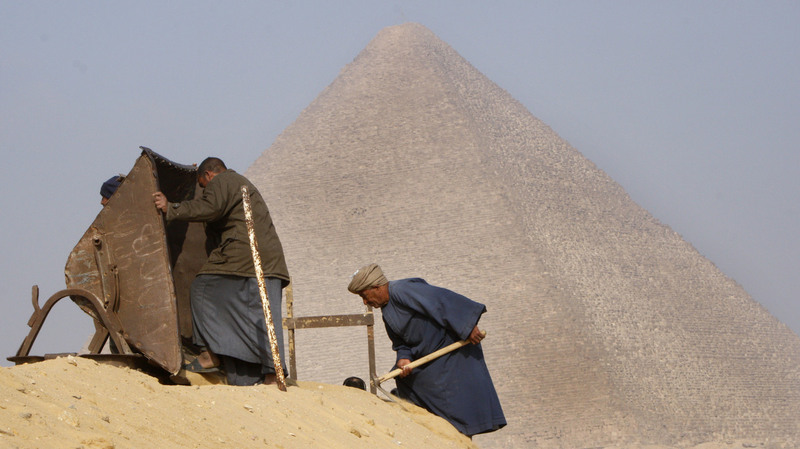 Archaeology workers toil in front of the Great Pyramid, in Giza, Egypt, in 2010. Researchers say they've discovered a new room inside the ancient structure. "The romantic interpretation and what everyone wants to hear is that this is a hidden room and the king's body is inside or there's grave goods we didn't know about or we're going to learn more about history ... and none of that is responsible speculation at the moment," cautions Peter Der Manuelian, an Egyptologist at Harvard University who was not part of the research team. "All we know is that we have a void, we have a cavity, and it's huge, which means possibly intentional and certainly worthy of further exploration," Manuelian says, noting that it's not yet clear whether it's a single chamber or more than one. "In that sense it's obviously frustrating," he says. "On the other hand, as an architectural discovery, something we didn't know about the interior of the Great Pyramid, it's absolutely big news." Indeed, the team that made the find reports that it is the first significant internal structure found within the Great Pyramid since the 19th century. Mehdi Tayoubi, with the HIP Institute in Paris, explains that he and his colleagues wanted to investigate the pyramid using the best available non-destructive analytical techniques. They settled on a type of imaging that involves muons, which are tiny particles, like electrons. "What is strange, for me, is to use those very, very small particles for a huge monument like the pyramid," says Tayoubi. Muons are made when cosmic rays from deep space hit the atoms of the upper atmosphere. These particles rain down and lose energy as they pass through materials — like the thick stones of the pyramid — and that makes them slow down and decay. By placing muon detectors in strategic locations, researchers can count the number of muons coming through and create a kind of picture that reveals whether the material above is dense, like stone, or an empty space. Tayoubi explains that his team installed sheets of muon-detecting film in a lower-level room of the pyramid known as the Queen's Chamber. The goal was to test whether they could use muons to accurately discern two well-known rooms located above: the King's Chamber and Grand Gallery. They saw those rooms but, to their surprise, they found an additional large space as well. "The first reaction was a lot of excitement, but then we knew that it would take us a long, long time, that we needed to be very patient in this scientific process," says Tayoubi. Because they didn't want to rely on just one method, they confirmed the find using two other muon-detection techniques. "The good news is the void is there. Now we are sure that there is a void. We know that this void is big," says Tayoubi. "I don't know what it could be. I think it's now time for Egyptologists and specialists in ancient Egypt architecture to collaborate with us, to provide us with some hypotheses." He's interested in whether small robots might somehow enter this space through tiny cracks or holes and provide more information. In the past, before the modern science of archaeology evolved, folks sometimes blasted through walls in the pyramids, says Manuelian. 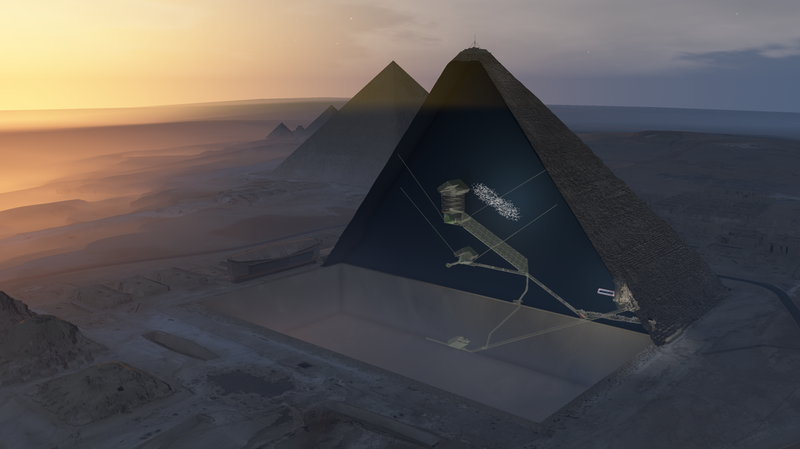 "That's the good thing about the muon project, there's absolutely no damage to the pyramid at all," says Manuelian. "I hope that, in collaboration with the Egyptian antiquities authorities, further exploration will be set in motion. The study of the pyramids has been going on for an awful long time. So any new contribution is always a welcome addition to our knowledge."